So one of my 2016 goals was not to sign up for swaps. This goal lasted approximately one month and then I signed up for one that needed to be shipped within a week. 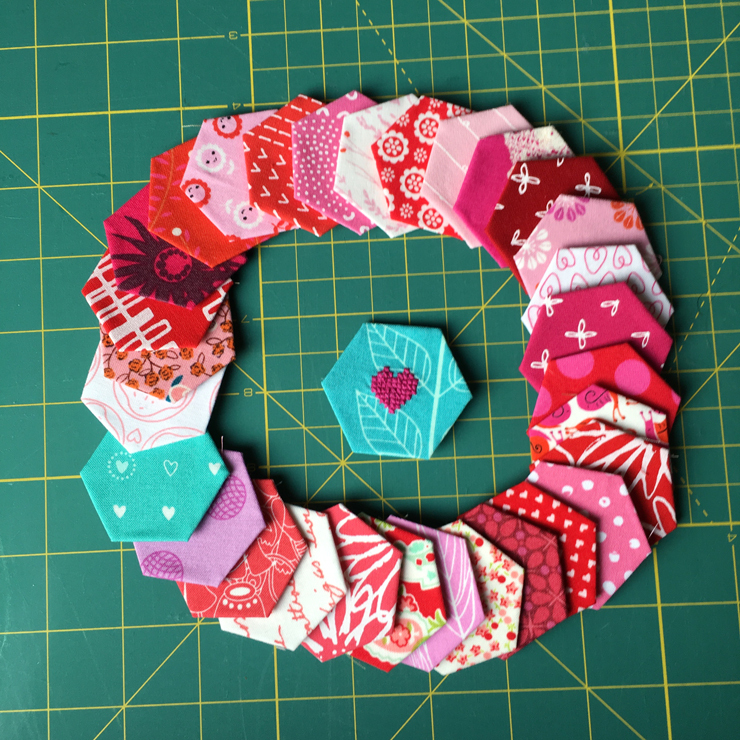 The swap was to send a heart coaster and 25 Valentine colored hexies. One of my partner’s favorite colors was teal so I declared that to also be a Valentine color. I’ve wanted to try out reverse appliqué for a long time but I’ve been nervous and have let that hold me back, but I immediately knew I wanted to try it for the heart. 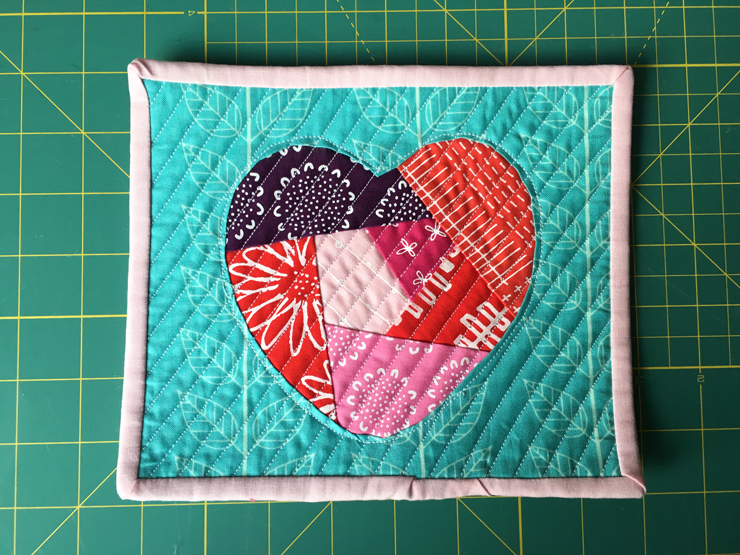 I used this paper pieced heart and reverse appliqué tutorial from Crafty Couture by TC. A local quilt shop got in a bunch of the Blueberry Park line of fabrics and I got 1/8 yard cuts of every one they had. I hadn’t used them for anything yet but I cut into all the pinks, reds, and purples for this. Then for the heart I used a teal fabric that someone sent me and I’m not even sure what it is. I used a light pink Kona cotton for the binding. 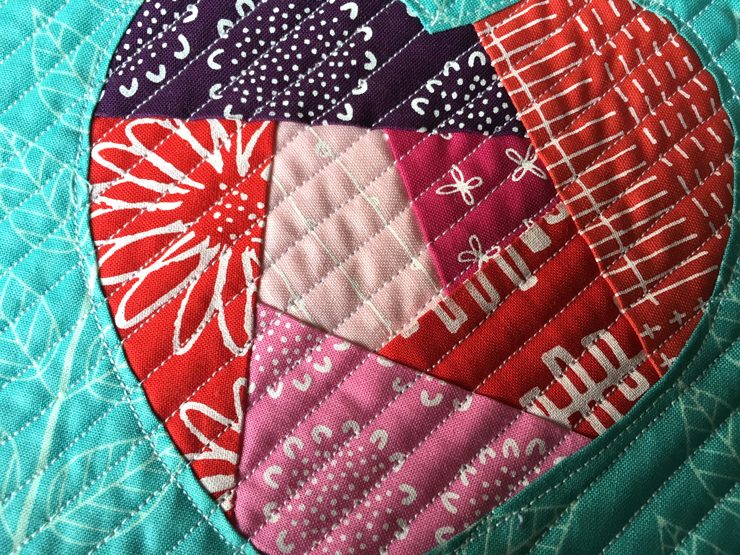 Small straight line quilting has quickly become my favorite. I use the edge of my walking foot as my guide so I only need to mark the first one. I did this for the Death Star mini quilt and the Teddies pillow. I used DMC DC90 Water Soluble Cross Stitch Canvas* to stitch the heart onto fabric before making it into a hexie. I made a heart hexie the first time I tried out water soluble canvas and now I want to add them to everything. And this one is probably my favorite that I made. Mollie from Wild Olive made a bunch of fantastic low volume Spoonflower fabrics and she gave me some. 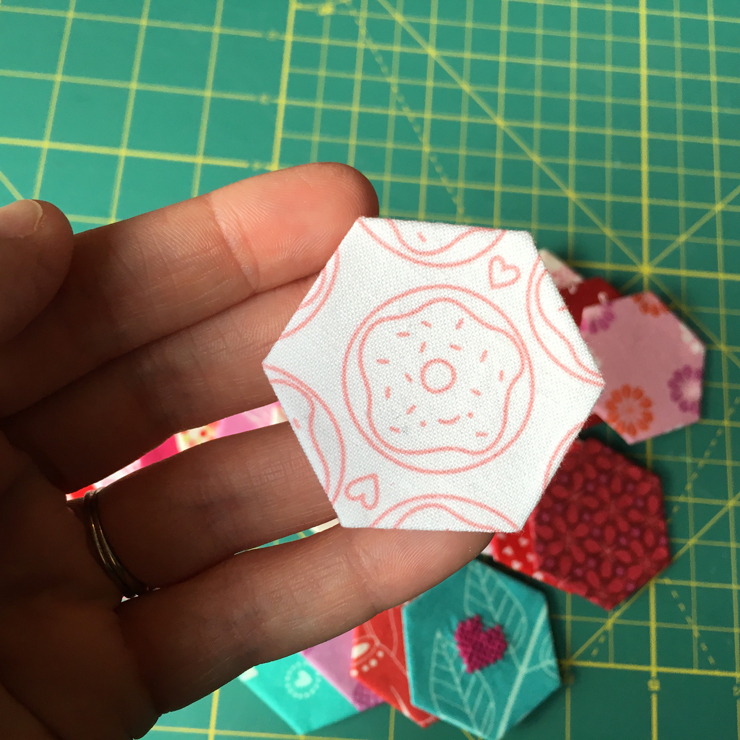 I couldn’t resist fussy cutting a cute donut for one. You can buy this or any of her other awesome fabrics on Spoonflower. Oh and I also signed up for a second swap… But after that I’m done! I swear! 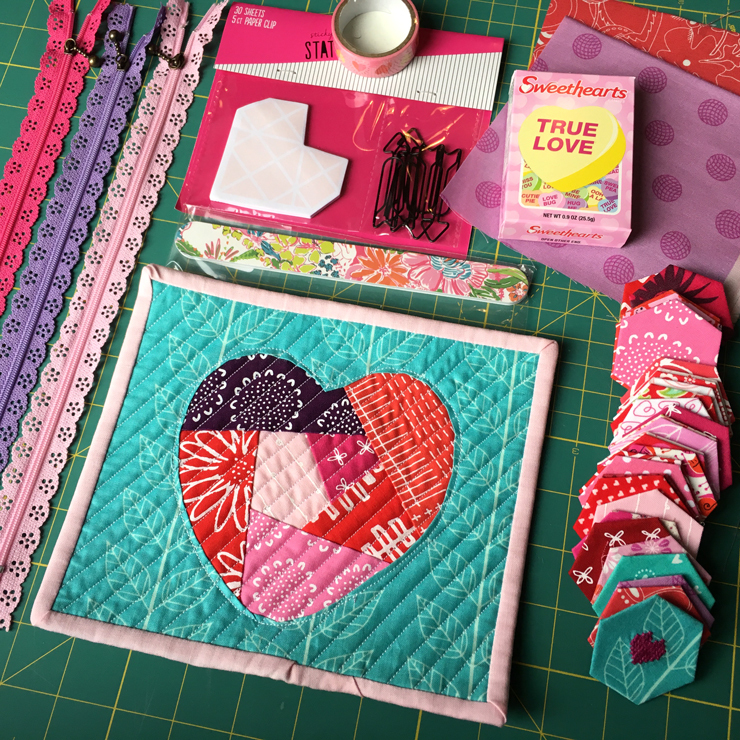 And while I did break one goal, I did succeed at another – “stop hoarding fabric.” Plus I tried a new technique, so really I think it was worth it. How are you doing with your crafty goals and resolutions? Did you break them as quickly as I did?